Following today’s Royal Ploughing Ceremony in Bangkok, royal astrologers have predicted a bumper rice crop and abundant supplies of food. In a country where superstitions and old traditions still play a part in everyday life, the forecast is based on two royal oxen eating rice and hay out of seven food offerings. Although the day isn’t an official public holiday in Thailand (banks remain open), it is a holiday for some government workers. The Royal Ploughing Ceremony marks the start of the rice growing season. The date isn’t fixed as it depends on lunar cycles and astrological predictions, but it is usually held in May. Officials in ceremonial dress lead the oxen and Royal Plough around Sanam Luang, the large open space opposite the Grand Palace and Wat Phra Kaeo. As a furrow is ploughed, rice seed is scattered. The oxen are then offered various choices of food including rice, corn and rice whiskey. Depending on what is eaten, royal astrologers make a prediction about how good the next rice harvest will be. 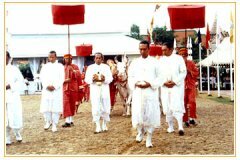 The Royal Ploughing Ceremony begins with the Lord of the Harvest (appointed by the king) performing the rite to predict the amount of rainfall in the forthcoming rice season. He is presented with three pieces of cloth from which he has to make one selection. Although the cloths appear identical, they actually vary in length. Selecting the shortest cloth means there will be plentiful rain during the season. 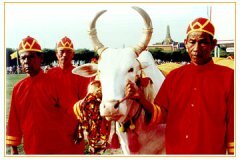 In Thailand the ceremony dates back over 700 years, although the ceremony is actually Brahmin in origin and was performed in India even before the time of the Lord Buddha. The ceremony fell out of favour in Thailand in the 1920s and was discontinued only to be revived again in the 1960s by the present king of Thailand, HRH Bhumibol Adulyadej. Today’s ceremony, as in recent years, was presided over by Crown Prince Maha Vajiralongkorn. The king’s health hasn’t been the best recently and his public appearances are now quite limited. However, King Bhumibol still has a major part to play as rice grown in the grounds of the king’s home at Chitralada Palace is sown in the ceremony. When the ceremony is finished, crowds of onlookers rush onto the field to gather the seed which is believed to be auspicious and will bring good luck. Farmers may mix the grain with their own rice stock or it might be retained as a good luck charm. Those farmers unable to attend the Bangkok ceremony still have a chance to obtain some of the royal rice. King Bhumibol sends a separate batch of rice grown at Chitralada Palace to the various provinces of Thailand which is then later distributed to farmers.